Hello Guys, okay your addicted? Hope so. In this tutorial I will show you how to play those classic games from the arcades to your Windows computer, online with players who do not even know. The was taking against the bar unfortunately was to bring, now all I want is to show to young people who have not had this immense privilege some how good you spend the afternoon at the corner of the bar playing games no less than the Mortal Kombat series, Street Fighter, Metal Slug, the series Marvel vs. Capcom and other unforgettable games, which today are successful. All right, play online is not the same thing as you can make fun of the guy loser to face with him, but the idea of ​​this post is to keep alive, these classic and become increasingly strong these on-line gambles further strengthening the good memories they brought us jogaços. I made a video explaining how to play all I quoted just above. 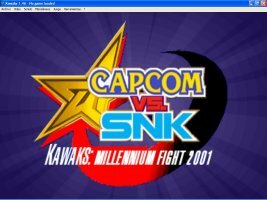 Still can not play all the classics of online arcades but many of them it is possible, so I will explain here how to play some compatible emulator WinKawaks able to run games such as Street Fighter Alpha 1.2 and 3. Metal Slug Blanka-hdstance_zpse1e4382c1, 2, 3, 4 and 5; Marvel Vs Capcom, The King Of Fighters, 95, 96, 97, 98, 99, X-Men Vs Street Fighter Marvel vs Street Fighter X-Men Children of the atom etc. To play online you will need the emulator WinKawaks 1:59 (I recommend this version as the server Kaillera players only use this version as being a more stable version and that gives less lag). Here on the blog Old cartridges you can find various roms (games) compatible with this emulator. I will leave just below the pages where you can download the version WinKawaks 1:59 and a list for roms comatíveis with this emulator for you to play online, I leave also the explanatory video for you to learn how to play online. So do not delay. Watch the video call friends who got used to losing you in the bar and tell the news to him. Any questions, suggestions or broken links, you know! Leave a comment below so we can constantly improve this post and also the blog.